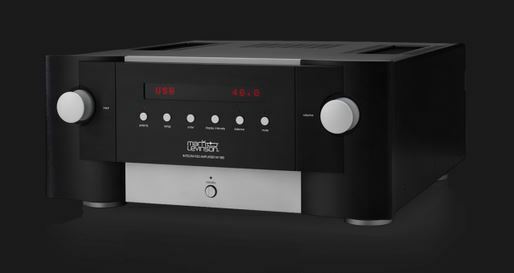 Mark Levinson began crafting high end audio components in 1972, and has moved from strength to strength ever since. The foundation of the No585 is its fully discrete, mirror-imaged, dual-monaural analog circuitry featuring individual signal switching relays for each of its four stereo inputs: one XLR and three RCA. Volume controls use discrete 15-bit R-2R ladders and low-noise analog switches for the widest possible bandwidth and maximum signal integrity. The fully-differential Class AB power stage includes an oversized 900VA toroidal transformer with individual secondary windings for the left and right channels. Each elegantly simple amplifier channel utilizes twelve output transistors and multiple smaller local capacitors that allow them to be placed physically closer to the amplifiers for greater transient response when power is needed immediately. This robust architecture results in a conservative power rating of 200W per channel with stability into 2 ohms. System integration and expansion are possible using the stereo RCA preouts which can operate full-range or with an included switchable, second-order, 80Hz crossover filter allowing for seamless integration into 2.1-channel systems with powered subwoofers. The proof however is an audition. – We’re hugely impressed, and that doesn’t happen easily!